Learn how to survive in emergency situations. A survival kit is a package of basic tools and supplies prepared in advance as an aid to survival in an emergency. Survival kits come in a variety of sizes and typically contain emergency supplies and tools to provide basic shelter against the elements, help keep warm, meet health and first aid needs, provide food and water, send signal to rescuer, assist in finding help. What Survival Kit packages contain? Supplies in a survival kit usually include useful items such as: A knife (often a Swiss army knife or a multi-tool), Matches, Tinder, A first aid kit, A bandanna, Fish hooks, sewing pack, LED flashlight with batteries and first aid supplies. The packages are designed by experts who determine the most likely products and tools one would need in life-threatening situations. In truth, it is a good idea for everyone to have a basic kit in their home or car. The fact is, we don’t know when disasters will strike. People lose their homes every day and are left with nothing. Hurricanes, tornadoes, floods, fires and other emergencies may leave you stranded without food, water or medical supplies. This emergency supply kit contains enough supplies to sustain two people for three days, as recommended by the American Red Cross. This emergency pack includes food, water and blankets, dust masks, a First Aid kit, two 12-hour safety light sticks, gloves, ponchos and an emergency whistle. The entire pack is stored in a backpack for easy carrying. This excellent disaster kit packs an amazing amount of necessary items into a hikers backpack. This pack can be used to make sure you’re prepared for natural disasters such as hurricanes, tornadoes, floods, fires and more. The pack includes such items as water, food bars, water purification tablets, a radio, a rechargeable squeeze flashlight, lithium batteries, a 30 hour-candle, whistle, compass, signal mirror, flint starter, glow sticks, matches, lighter, sleeping bag, rope, rain poncho, knife, gloves, mask, wipes, tissue, bandages, toothbrush, alcohol pads, sunscreen, burn cream, ointment, waste bag and more. This package can support one person for three days with over 30 items including: food and water, a first aid kit, hand warmer, light stick, safety matches, candle, and blanket, water packets, nine 400 calorie bars. In addition, the kit includes a first aid container that includes three alcohol preparation pads, five band-aids, two sterile gauze pads, four aspirin, two antibiotic ointment packets, four moist towelettes, one instant heat hand-warmer packet, one chemical light stick that provides up to 12 hours of illumination, one box of 50 waterproof safety matches, 4 candles. This pack is just right for keeping on hand in the event of emergencies, power failures, hurricanes, floods, and other unexpected events. 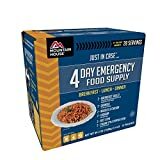 The 4-day Meal package from Mountain House provides meals that are easy to prepare under challenging circumstances. The meal packages include three breakfasts, three side vegetables, and six 10-ounce packets of lunch or dinner entrees. This meal supply has a seven-year shelf life. All of the meals can be easily prepared by adding water. This tool was originally developed for the Swedish Department of Defense. The primary purpose of the Swedish FireSteel is to create sparks to make it easy to start a fire. It generates a 3,000°C spark to make fire building easy in any weather, at any altitude. The FireSteel is used by a number of armies around the world, and is a favorite of outdoor experts, hunters, fishermen and campers. Plus, it is a great way to light stoves and gas-barbecues. If you prefer to build your own kit, you can buy all of the items individually. The DIY method can certainly save you some money, but you have to do all of the work yourself. Here’s a list of items you may want to include. Batteries – Include general use batteries as well as any specialty batteries for things like phones, hearing aids, etc. Battery operated radio – If the power is down, a good battery powered radio will allow you to keep in touch with emergency announcements, weather updates, and more. Magnifying glass – A magnifying glass can be used to start a fire by focusing a ray of sunlight on flammable material. This will come in handy if you run out of matches. Money (variety of bills and coins) – In major disasters, power outages may prevent banks from opening and the ATM’s may not work. Have money in a variety of denominations for emergency use. Include some coins in case you are able to use a vending machine. Needles and thread – For emergency stitches or to repair clothing. Pencil – Use for recording important information, drawing maps, etc. Read-to-eat meals (MRE’s) – One of the most important items is food. Make sure you stock away an adequate supply of MREs, food bars and more for your DIY supply package. Scissors – Scissors will come in handy for cutting bandages, rope and more. Sun screen lotion – You may be exposed to harmful sunlight for many hours. Sunscreen will help protect you from getting a painful sunburn, which will further dehydrate your body. If you have any questions about these survival kits and accessories, please post a comment below. If you’d like to learn about the types of equipment used by private investigators, visit our spy gear section. Also, check out the ultimate way to survive Armageddon in the Survival Condo, an underground bunker built inside an old missile silo.